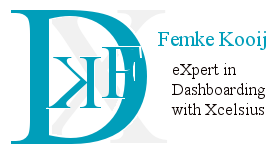 On this blog I have published some demo dashboards I have created with Xcelsius, a dashboarding tool from SAP|BusinessObjects. Furthermore I maintain a Tips, Tricks & Hacks section, where I publish answers to questions / problems / frustations I have had myself or solved for somebody else. I started working with Xcelsius quiet a few years ago, in 2004. No one here had heard of the tool/product, not even the Business Objects sales consutants who visited me a year later for another project. I had to inform them they had aquired Xcelsius from Infommersion. A lot has changed since then and Xcelsius is growing up. It is becoming more advanced with each new service pack and more integrated within the SAP|BusinessObjects reporting suite. Recently I started to venture out to Tableau Software, I also published some topics on that, eventually those will be seperated from Xcelsius, but for now my focus is on mastering the tool.